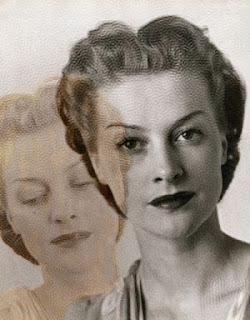 Josef Breitenbach... A Woman and Her Conscience, New York (c. 1945, Vintage toned gelatin silver print). From Works by Josef Breitenbach at Gitterman Gallery in New York. "...Josef Breitenbach created a unique visual vocabulary by incorporating both traditional and experimental processes within a variety of genres throughout his career. Raised with a profound respect for the history of art and culture, he worked with a conscious understanding and appreciation for many different styles of artistic expression, including Modernism, Surrealism and even Pictorialism. Breitenbach explored form and abstraction as well as the sensual and psychological side of his subjects. His photographs exist as aesthetic objects that are also artifacts of a highly innovative period of our history."